This video of a supposed tungsten-filled, ersatz gold bar is getting the gold world all atwitter. As you may know there are persistent rumours of fake, tungsten-fild bars held in banks. 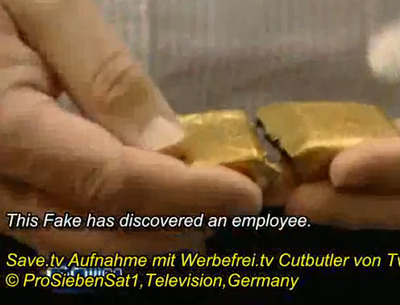 Some even think Fort Knox gold is fake. Gold bugs eat this stuff up. Embedding is disabled, so you’ll have to click the pic to jump over to YouTube.